I chose Chester because I wanted to do a lower league management story, I thought Chester was they best fit as I know quite a lot about them. They are a decent club which has a great future and I wanted to come along for the ride! What Are My Plans For This Story?
. Win as many trophies as possible.
. Increase stadium capacity to 50-60,000.
. Develop young English talent.
. Invest lots of time/money on the youth facilities.
. Work my way to into the manager Hall of Fame.
. Become a Chester legend. 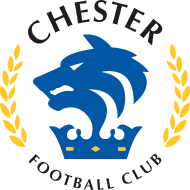 Chester Football Club is a supporter-owned English football club based in Chester, England. The club was founded in 2010 following the winding-up of Chester City F.C. The club, which plays its home games at the Deva Stadium, began its inaugural season in the Northern Premier League Division One North following a successful appeal to the FA against their initial placement in the Northwest Counties League. Since foundation, the club has been successive league champions of the NPL Division One North (2010–11), the NPL Premier Division (2011–12), and the Conference North (2012–13). In the current 2013–14 season Chester F.C. are playing in the Conference Premier. Good luck and awesome badge. [hide][/hide]Good luck, definitely will be following. One of my favorite lower league players is at Chester, big Gareth Seddon! Will also be following this story! Good luck! Will be following this story! You are reading "Chester FC - The Touch of Success".